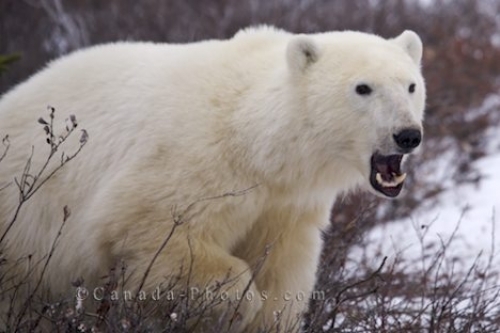 An image that is very memorable while visiting the Churchill Wildlife Management Area in Manitoba is to see a large polar bear emerge from the bush with his mouth wide open. This open mouthed Polar Bear is just showing us his teeth during a big yawn, it is not a characteristic to be threatened by. Picture of a Polar Bear letting out a yawn after resting on the tundra of the Churchill Wildlife Management Area in Manitoba.